eggs | What's Cooking at the Genua's? I’ve made this recipe twice now and I tweaked it even more from the original recipe from Kraft. Made it better! And sorry, it’s not low-calorie, but come on, its got tater-tots in it! Or as they are sometimes called potato tots, potato puffs, etc. I have used Great Value brand and Aldi’s brand. Both came out amazing! The pictures are from the first time I made it since I forgot to take pics the second time. It was Super Bowl Monday the 2nd time and it sure hit the spot that morning! First time I made it I forgot to cover it when I baked it, still came out good but it needs to be covered. Omg, sooooo incredibly delicious! It can definitely be prepared the night before and then baked in the morning. For the sausage, I use whatever type of sausage I have in the house. Usually some kind of chicken sausage. I’ve used the Italian style and it’s fine. The original recipe also called for 2.5 ounces of bacon! HA! I used a whole pound. Also, the original called for a 10.5 ounce can of cream of potato soup. The store was out of it when I went so I used the big “family” size can. I think it’s like 23 ounces. I used it all! Makes it much creamier. This recipe is so simple to make. You will NOT be disappointed! Mix all ingredients in a large bowl, except for 1/2 cup of the cheddar cheese. Pour into a large casserole dish making sure it’s all distributed evenly. Cover and bake for 35 minutes at 350°. Sprinkle with remaining cheddar cheese and bake uncovered another 5 minutes, or until cheese is bubbly! Serve hot! If you want, add a dollop of sour cream to each serving. I only used half of the squash and it was plenty. And to make it all worth while, ¼ of the Quiche is only 272 calories! Bonus! 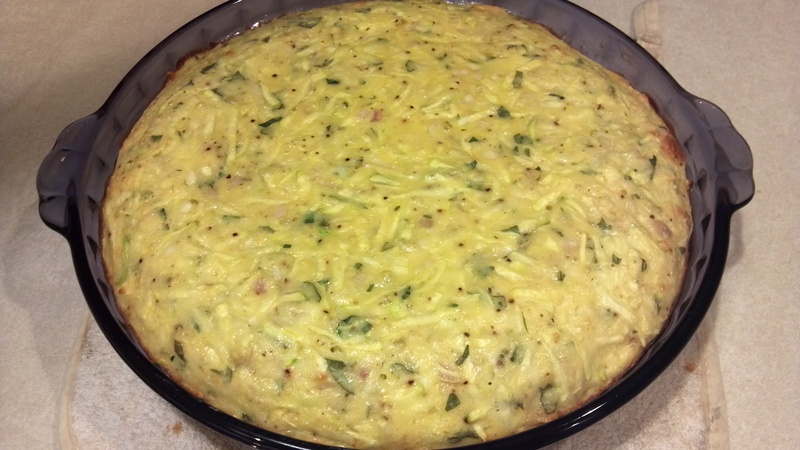 This recipe will make about 8 pieces We usually each have ¼ of the Quiche as a serving though. Oh and did I mention, it’s crustless! 2. 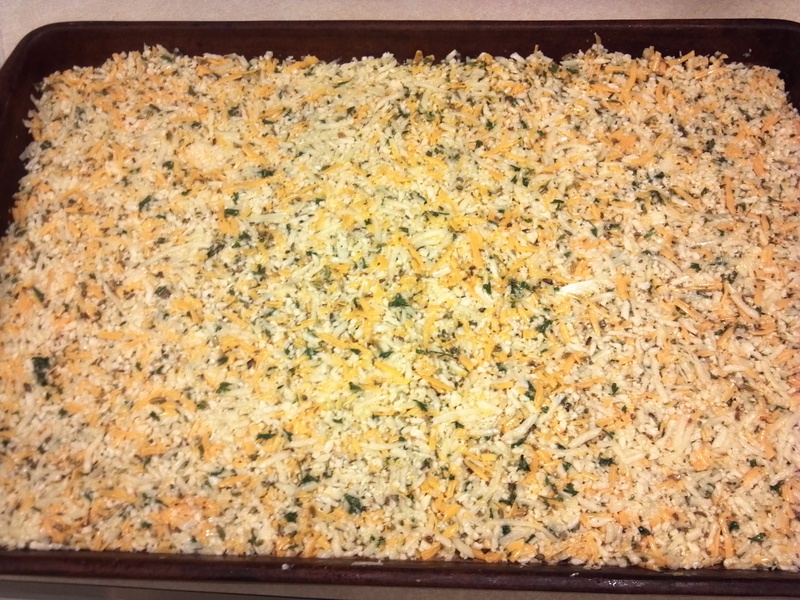 Pour ingredients into a casserole dish or any type of baking dish you have. An actual Quiche pan may be too small. Spray the pan with cooking spray. 3. Bake at 375 for about 45 minutes. Let sit about 10 minutes when done. It will rest this way. 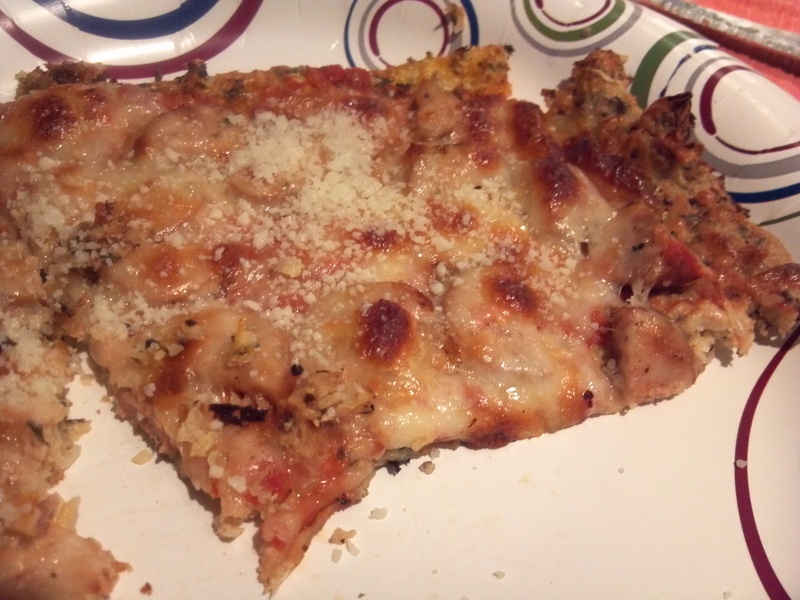 As promised, here is a recipe I made for pizza with a cauliflower crust. I was at a Weight Watchers meeting a couple of weeks ago and I heard someone mention making a pizza crust with cauliflower. I was intrigued! My husband is doing his Atkins thing, again, so he’s avoiding bread like the plague. I however still want my bread! But to be nice I researched the alternatives using cauliflower. Now I will say, it’s not like normal pizza crust. It’s not bread! But, it is still really good! I was pleasantly surprised at the outcome and my husband loved it. So I guess it was a success. I have made it twice now so it’s a keeper for sure. And for those of you out there crinkling up your noses, it doesn’t taste like cauliflower! Honest! It is a little soft but hardens a bit when it starts to cool out of the oven. What I really like about this is you can put anything you want on it to make it a pizza. I used chicken sausage, some tomato sauce and some cheese. Incredibly delicious! So be daring, make some cauliflower crust pizza today! It’s worth it! Honestly the hardest part is shredding/chopping the cauliflower. Don’t be scared. It’s a taste sensation! 1: Finely chop, shred or rice cauliflower until you have 2-3 cups of cauliflower. Add the eggs and shredded cheese. 2. Add the spices and mix well. 3. Press the mixture into a greased pizza pan or cookie sheet. (Don’t worry if it doesn’t fill up the entire sheet, mine didn’t the first time I made it) First time I used a cookie sheet. Second time I used a stoneware baking sheet. I think the cookie sheet worked better. It’s up to you though. 4. Bake at 450º for about 20 minutes. If it is starting to brown and crisp on the edges it’s good. You can cook a little longer if you want. 5. Remove from oven and add desired toppings. Be careful with sauce, don’t over-sauce as it will make the crust too soggy. I used about ½ cup sauce and spread it thin over the crust. 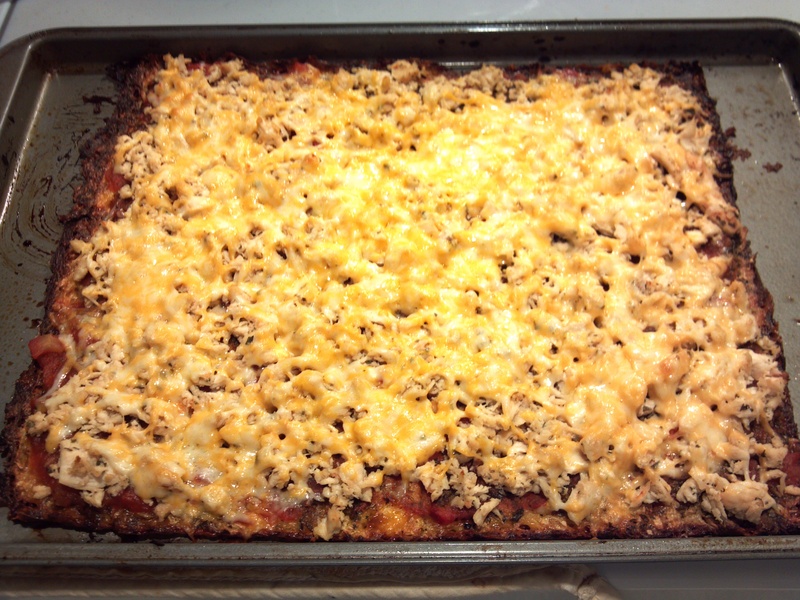 I topped it with chopped chicken sausage and part-skim mozzarella. Use whatever you want!! Now before you think this is just another boring Quiche, think again! This recipe is one of the most incredibly moist, creamy and delicious Quiche recipes I’ve ever made. It was originally a Weight Watchers recipe that I changed a bit. My version came out incredible. My husband loved it and I can’t wait to make it again. The wonderful thing about it is that there is no cream, no milk, no half-and-half at all in this recipe! It is pretty low-calorie and yet tastes so decadent that you’d never believe it good for you! Well it is. A great recipe to make ahead and freeze too! The original recipe was for ‘mini Quiche’. It was supposed to make 48 little tiny Quiche type bites. Great for a brunch or breakfast. I chose not to do that and we had it for dinner. And breakfast, and lunch. You will not miss the crust. Who needs all those extra useless calories! 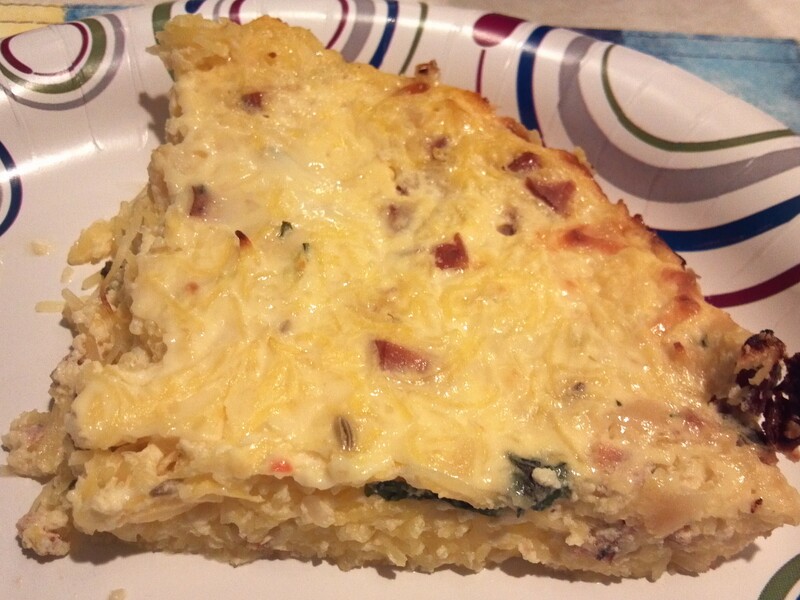 Crust just covers up the taste and creaminess of the Quiche! The Quiche was so fluffy I was amazed. Usually when I make something like this it falls and flattens when it cools a bit. Not this recipe! Ok here is the recipe! OMG So incredibly creamy and delicious! Preheat oven to 375ºF. Coat a glass or non-stick Quiche pan or round casserole dish with cooking spray. Remove from oven and let cool for a few minutes before serving. The Quiche will continue to set up. Well being back at work after 18 months is beyond exhausting. The main thing is I am now in an office job! Haven’t had an office job for 7 years! I LOVED my last job, I worked from home on my schedule. It was wonderful. But alas, our economy had other ideas. Either way I am now in my first week back and I’m so tired every night I barely have time to read emails. I am going to do my best to get the blog done without fail though. I’m sure once I get back in a routine I will be fine. But till then please bear with me! Thanks. Ok, this recipe I found in a Rachael Ray magazine but it’s also a recipe from CorningWare. I have not made this yet but it looks pretty easy and I plan to do this next time I have brunch or company stay over on the weekend. I love a good Bloody Mary so this sounded intriguing. No there is no vodka in it but that doesn’t mean you can’t make an actual Bloody Mary to go with it! It’s an easy recipe so give it a try. I will swap out the photo once I make it myself! The recipe says to use a 1.5 quart square casserole but you can use a longer one also. 1. Grease a 1.5 quart square casserole dish. Arrange 2½ slices of bread in the bottom of the dish. Sprinkle 1/3 cup shredded cheese on top and cover with another 2½ slices of bread. 2. Layer on another 1/3 cup shredded cheese and top with the final 3 pieces of bread. 3. In a medium bowl, beat eggs, milk and celery salt. Pour over the bread layer; let stand. 4. 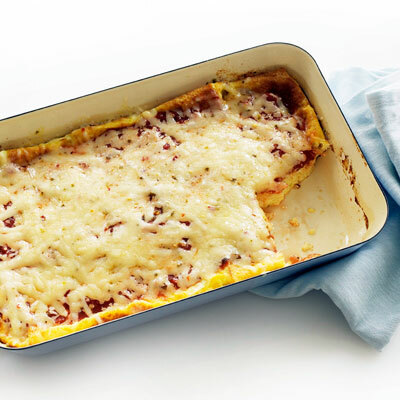 Bake in a 375º oven for 40-45 minutes, then cover with salsa, sprinkle with remaining pepper jack cheese and bake for 5 minutes more. 5. Let stand for 5 minutes before serving. Well tomorrow is Christmas Eve! Wow where did the time go to? 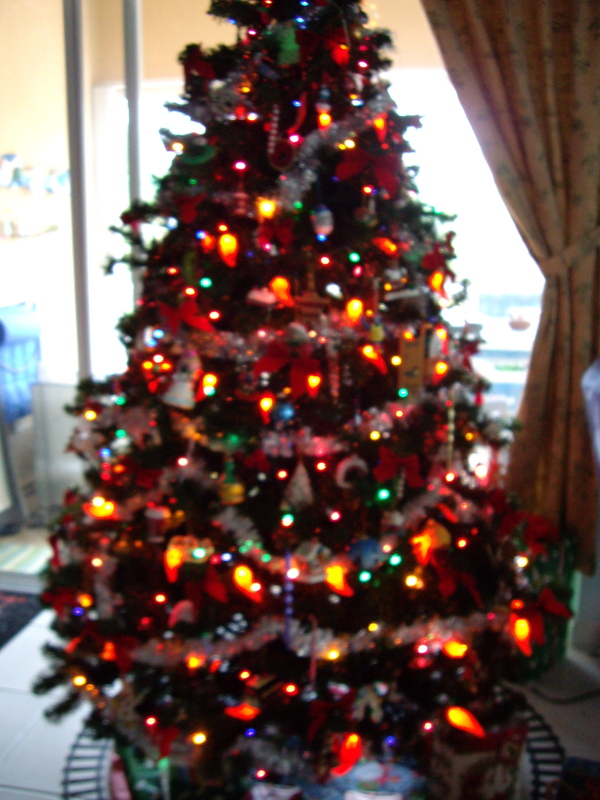 As a kid Christmas could not get here fast enough and now many years later, ok decades later, Christmas appears as if out of nowhere! It was just Halloween! My house is decked out, inside and out, and it is certainly festive looking! The weather is cooler, in the 50s and 60s so it’s not so hot that we do forget it’s winter here in south Florida. And I am still sticking with my no dieting till after the New Year. Weight Watchers can wait a little longer for me! So here I am putting together the last “cookie” blog for the year. These cookies are actually brownies, but also a lollipop. But hey, I’m using it anyway. I am not really a big brownie fan. Never was. Love making them but not eating them. The only ones I truly LOVE are my friend Debbie’s. They are little bitty ones and she puts frosting on them! I swear they must also have some kind of booze in them or something. They are so moist and just down right addicting! I could eat a dozen no problem! But these are not those. Sorry. I will have to get her recipe another time! These are just too cute not to include them and the kids will love them also. I have not actually made these as of yet but I think I will soon! I actually got this recipe from Land-o-Lakes. Aren’t they just adorable! Holiday nonpareils, jimmies, sprinkles and/or decorator candies. Your choice! 2. Combine ½ cup butter and 2 ounces chocolate in 2-quart saucepan. Cook over medium heat, stirring constantly, until melted (3 to 5 minutes). Add sugar, flour, eggs, vanilla and salt; mix well. 3. Spread batter evenly into greased 8-inch square baking pan. Bake for 23 to 27 minutes or until brownies just begin to pull away from sides of pan. Cool completely. 4. Melt remaining ¼ cup butter and 1 ounce chocolate as above. 5. Finely crumble cooled brownie into large bowl. Add butter mixture and powdered sugar; mix well. 6. Shape mixture into 1-inch balls; place onto waxed paper-lined jelly roll pan. Cover with plastic food wrap; refrigerate until firm (at least 2 hours or overnight). 7. Melt candy coating according to package directions; keep warm. 8. Remove 1/3 of balls from refrigerator; insert lollipop sticks. 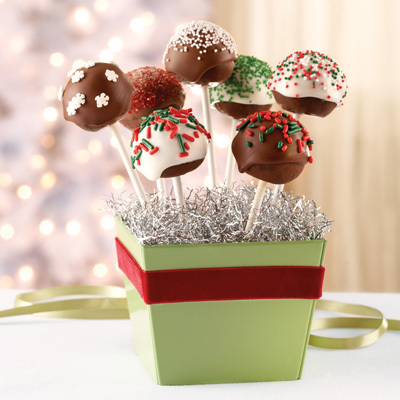 Dip balls into melted coating, swirling or tapping off excess; press coated balls into desired decorations. Push lollipop stick into craft foam or place coated balls onto waxed paper. Repeat with remaining balls. Let stand until coating is set. These cookies are very festive looking with their white chips and red cranberries! To make them look even more Christmas-like you can even add some shelled pistachios! The green will be subtle but very classy looking. These cookies are also pretty easy to make. They are drop cookies. Nice and simple. 1. Combine flour, baking powder, salt, and baking soda. Set aside. 2. Beat butter at medium speed with an electric mixer until creamy; gradually add sugar, beating well. Add egg, 1 at a time, beating until blended after each addition. 3. Add flour mixture to butter mixture gradually, beating at low-speed until blended. 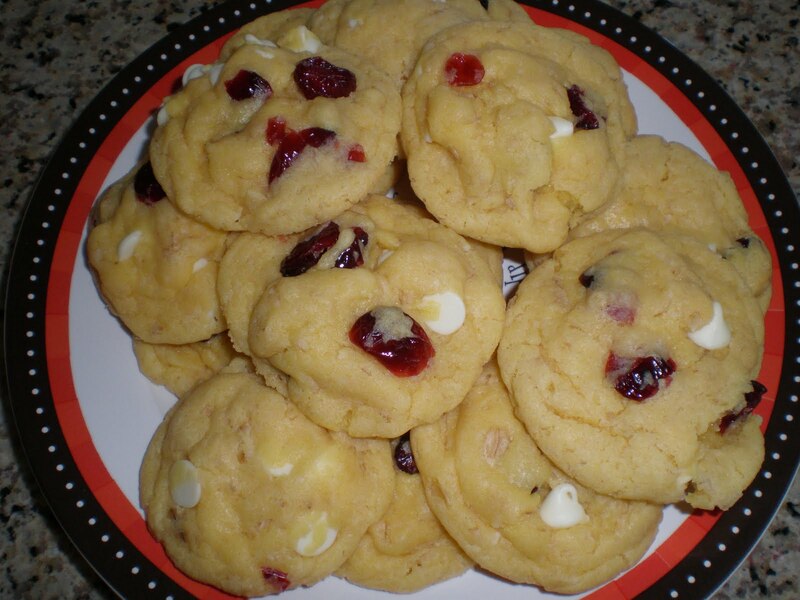 Stir in white chocolate morsels and cranberries. 4. Drop dough by heaping tablespoonfuls onto lightly greased baking sheets. 5. Bake at 350º for 10-12 minutes or until lightly browned on bottom. Remove to wire racks to cool.